1. Bring a large pan of water to the boil and cook the asparagus tips for 2 minutes until tender. Add the peas for the last minute of cooking, drain and refresh under cold running water. 2. In a large bowl, whisk the mustard with the vinegar, garlic, sugar and oil until thick and emulsified. Season well. 3. Add the cannellini beans to the dressing, then the asparagus and peas, and toss gently to combine. Add the mint and toss again. 4. 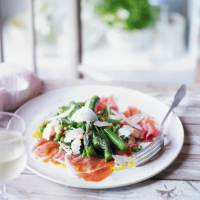 Lay the prosciutto out on 2 plates, top with the salad and shave over the pecorino. Drizzle with any remaining dressing.